Musick's Ferry Site, 23SL17 The Musick's Ferry Site in St. Louis County was situated along the Missouri River. 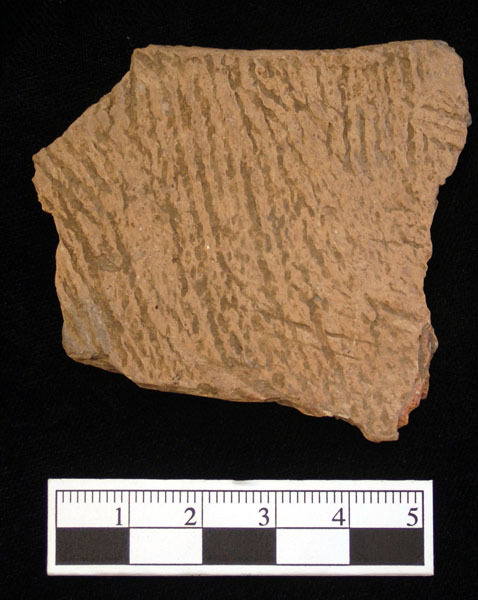 The site was registered with the Archaeological Survey of Missouri during 1950 by Leonard Blake and Lloyd Rose. A sample of artifacts are curated in the Museum of Anthropology at the University of Michigan in Ann Arbor. 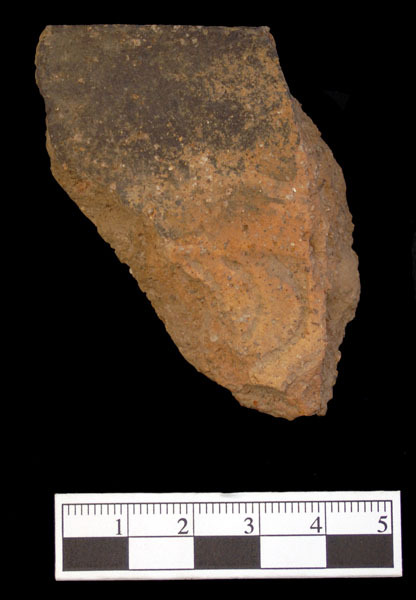 Damaged three quarter grooved axe discovered in 1950. 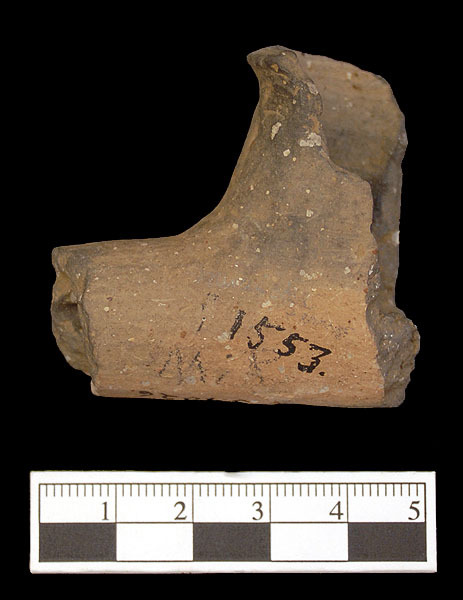 The base of the axe was damaged in antiquity. Scale in centimeters. 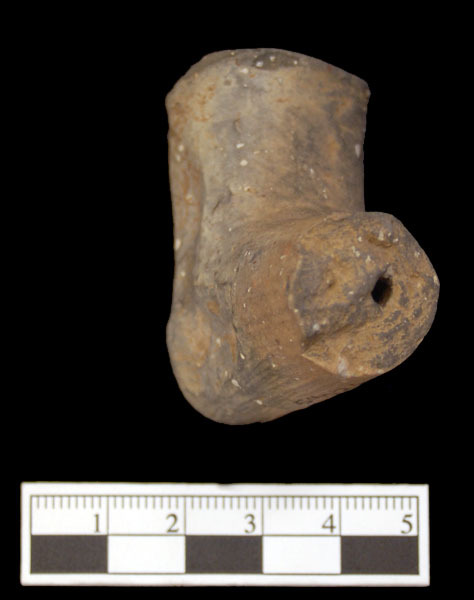 Clay Elbow pipe. Scale in centimeters. 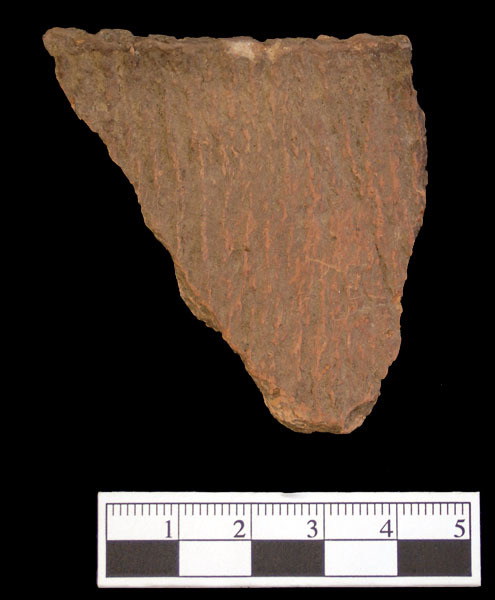 Projectile point. Length = 28.5 mm, Width = 22.3 mm, Thickness = 6.3 mm, and weight = 4.1 grams. 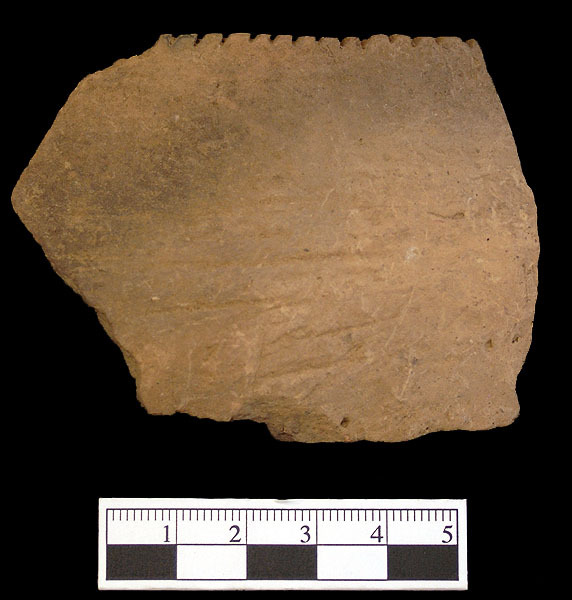 Shell tempered rimsherd from a carinated bowl with incised lines. Thickness = 6.3 mm and weight = 22.1 grams. 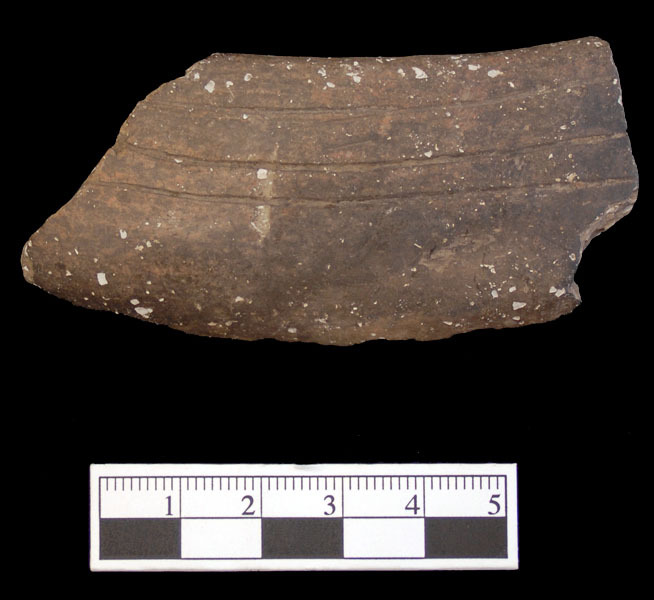 Shell tempered rimsherd with red slip. Thickness = 6.6 mm and weight = 26.5 grams. 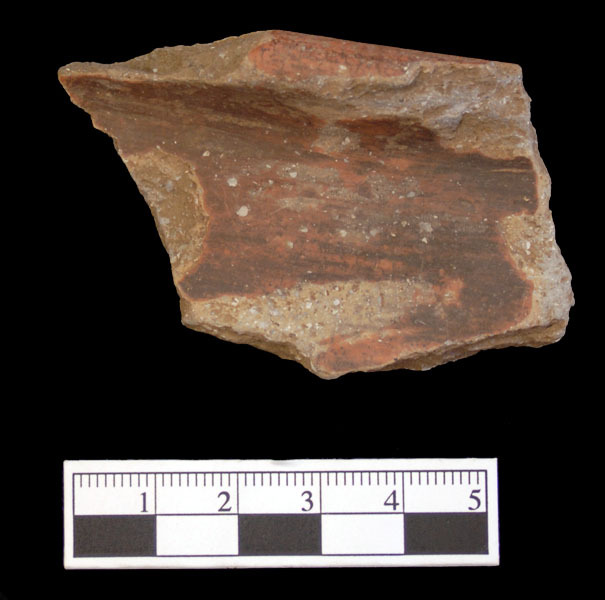 Shell tempered rimsherd with red slip. 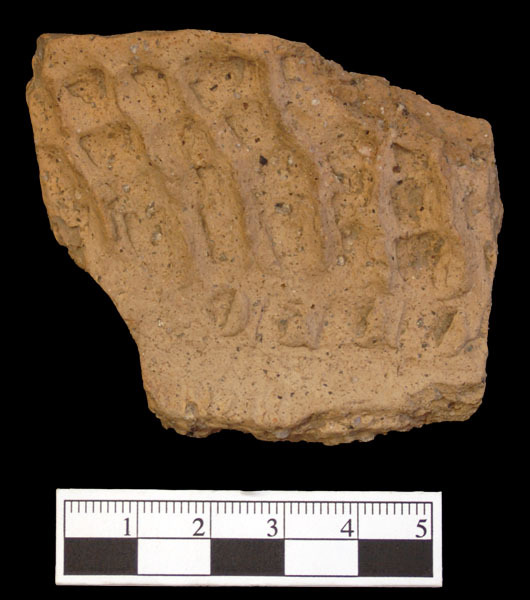 Stamped rimsherd. Thickness = 9.6 mm and weight = 40.7 grams. 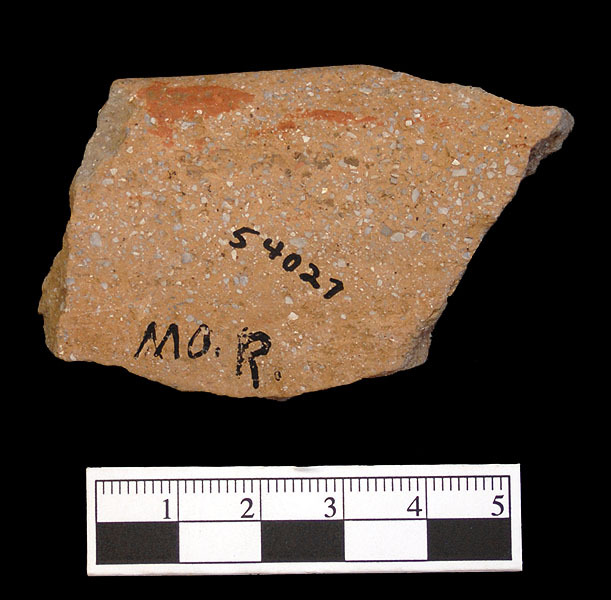 Middle Woodland Period sherd with stamped and zoned decoration. Thickness = 11.8 mm. 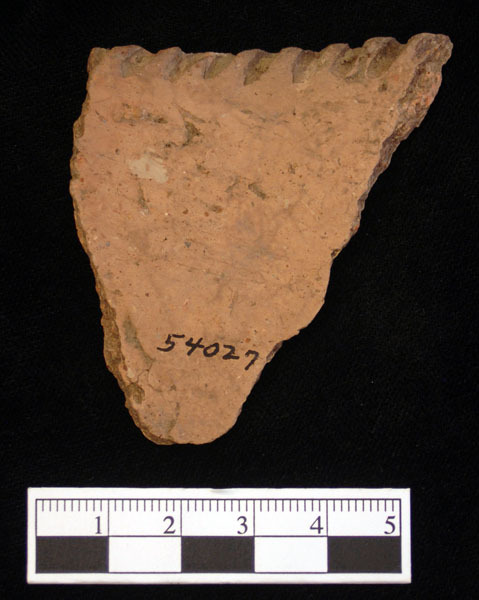 Middle Woodland bodysherd with stamped dentate decoration. Thickness = 11.5 mm and weight = 25.6 grams. 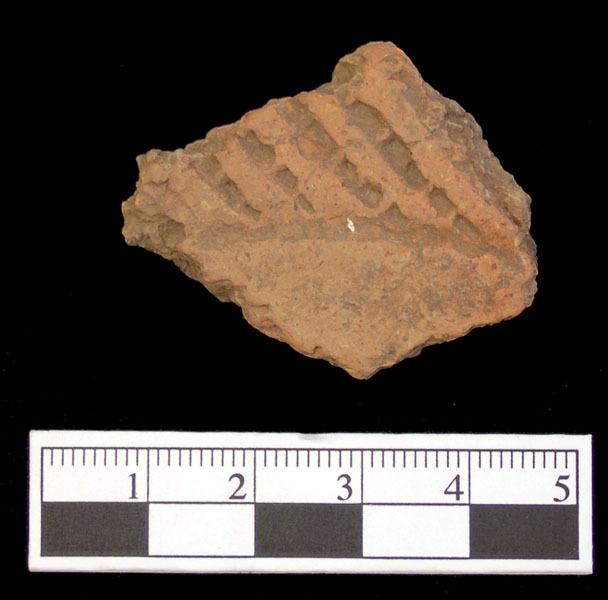 Middle Woodland Period rimsherd with rim notching. Thickness = 7.5 mm and weight = 29.7 grams. 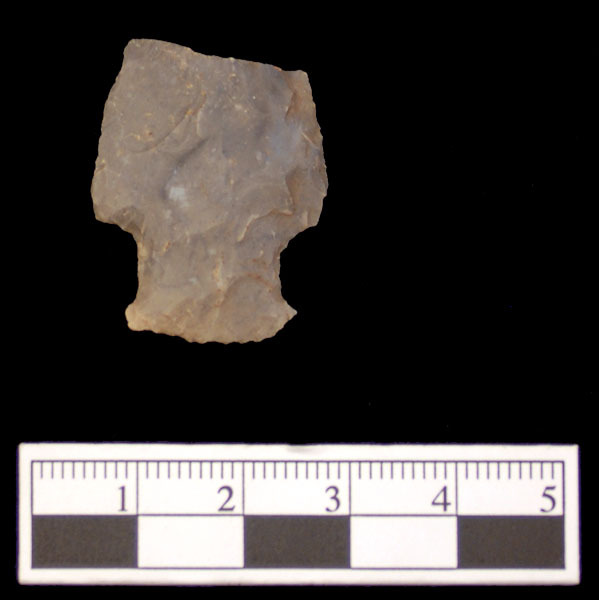 Rimsherd with fine notching on the bowl lip. Thickness = 6.6 mm and weight = 41.6 grams. 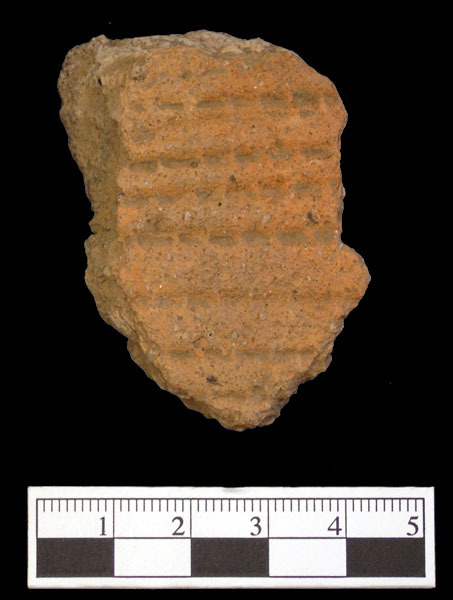 Woodland Period sherd with cordmarked decoration. 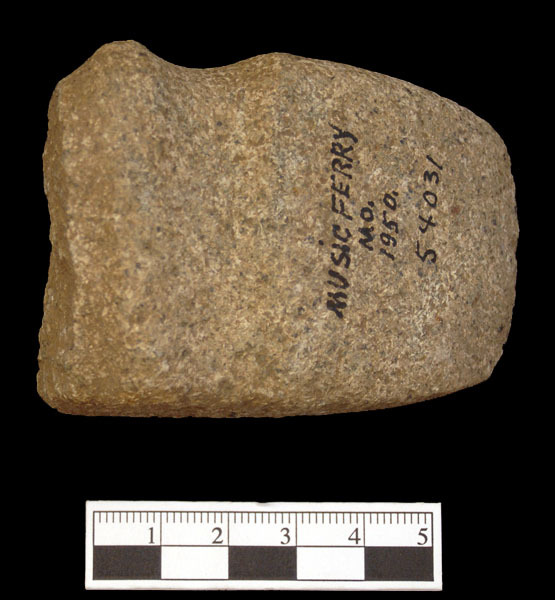 Thickness = 8.2 mm and weight = 24.9 grams. 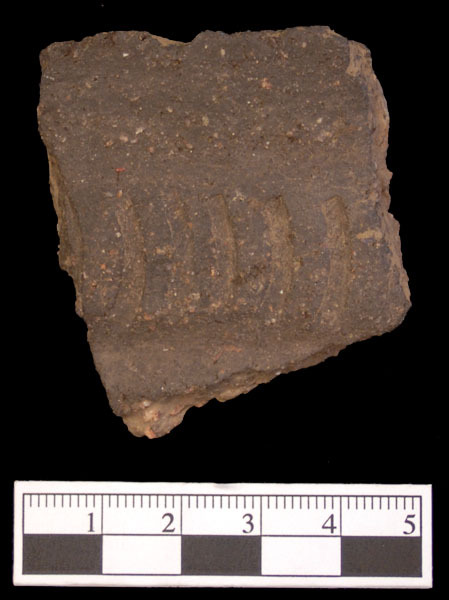 Exterior and interior views of a Woodland Period rimsherd with cordmarked decoration. Thickness = 4.9 mm and weight = 17.1 grams. 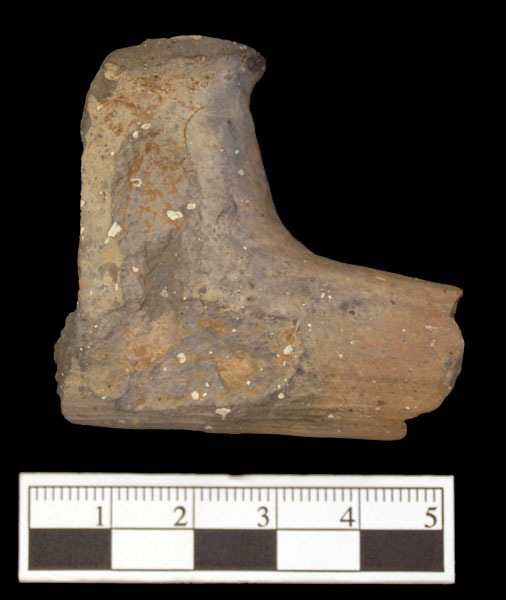 Thanks to Karen O'Brien (Collections Manager, Museum of Anthropology, University of Michigan) and John Speth (Curator, Museum of Anthropology, University of Michigan) for permission to study artifacts from Missouri in the Museum of Anthropology at the University of Michigan. 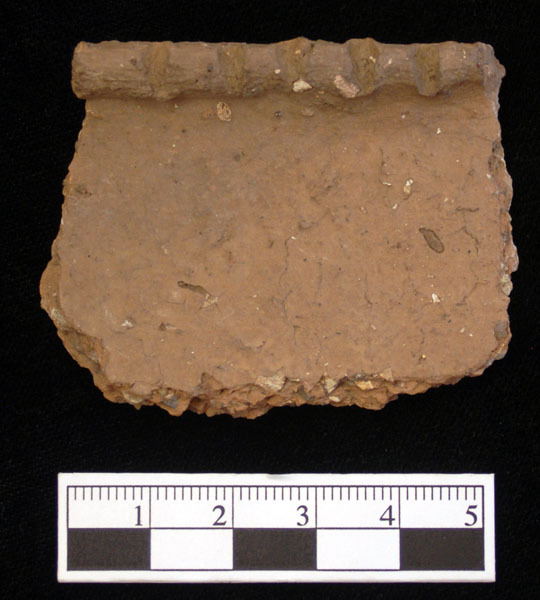 Special thanks to the late Dr. Leonard Blake (Washington University in St. Louis) for teaching me about St. Louis sites excavated by amateurs in the 1940s and 1950s. Many smiles to Ettus Hiatt for her help with text and content editing.